Paul had made a subsequent visit to Jerusalem and to Antioch in perhaps 52 or 53 AD, which is recorded in Acts chapter 18:18-23. Whether Paul had brought any gifts to the poor of the saints in these places at that time cannot be determined, as the description of that journey is very concise and there are few records in the epistles. Now it is early 57 AD and Paul continues in his endeavor to fulfill his promise which was originally made in 48 or 49. In Acts chapter 24, after his arrest in 57 AD, he is quoted as having said to Felix “Now after many years I came to bring alms to my nation, and offerings.” However the description “after many years” does not with any certainty exclude the possibility that Paul had brought alms to Jerusalem in the visit of 52 or 53 AD as well as in 57 AD. 1 Certainly it is superfluous for me to write to you concerning the service which is for the saints. 2 I know your readiness, which concerning you I boast of to Makedonians; because Achaia had been prepared a year ago, and that of your zeal the greater amount is provoked. Paul had already written concerning this service, so here he characterizes his exhortations as an unnecessary reinforcement of something already being done, which is in itself a tactic whereby he is actually offering encouragement to his readers. 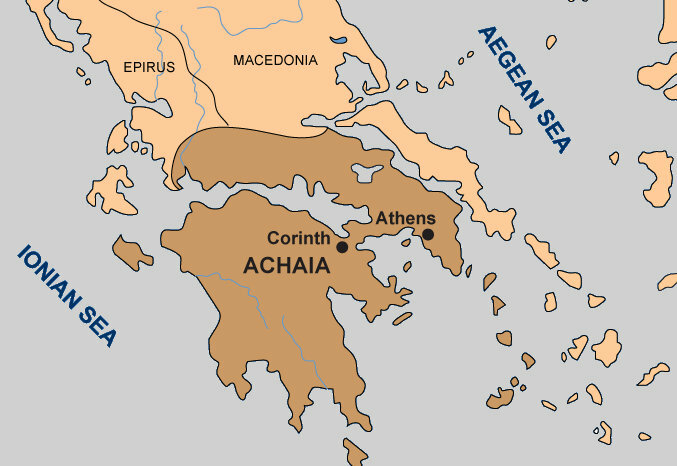 Corinth was in the Roman province of Achaia, which included all of the Peloponnesus along with a portion of mainland Greece. Paul had said at the end of his first epistle to the Corinthians: “1 Now concerning the collection that is for the saints, just as I had prescribed to the assemblies of Galatia, in that manner also you should do.... 3 And when I have arrived, whomever you may approve I will send them with instructions, to have your kindness carried off to Jerusalem; 4 and if perhaps it would be sufficient for me also to make the conveyance, they shall go across along with me. 5 Now I will come to you whenever I shall have passed through Makedonia; for I am passing through Makedonia.” That first epistle to the Corinthians was written about a year before this epistle was being written, in the early months of 57 AD. Paul is not yet aware of the extent of any gift which the Corinthians had collected for the saints, but he must have had some sort of pledge from them, and he is now presuming that they had it already prepared. Where Paul says “I have sent the brethren”, he intends Titus and the unnamed brother who had been chosen by the Corinthians to deliver their gift to Jerusalem on their behalf. Where he is described in chapter 8 of this epistle, we had speculated that he may have been that “Erastus the chamberlain of the city” whom Paul mentions in Romans chapter 16, which we believe may be the best and the only plausible conjecture as to the identity of this person. In any case, Titus must have brought this other individual to meet Paul in Nikopolis, and then Paul sent them both back to Corinth with this letter. Therefore Paul had not sent them as of yet, but delivering this letter after he completed it they would be present when it was finally read by the Corinthians. From Paul's statements here, it is evident that he had encouraged the generosity of the Makedonians in the collections for the saints by informing them of what was being done in Corinth in regards to that collection. Here in chapter 8 of this epistle, Paul had in turn encouraged the Corinthians by informing them of the sincerity and abundance of the gift of the Makedonians. Ostensibly, Paul does this in order to encourage each of these assemblies to make sacrifices for the benefit of Christian communion. 4 lest perhaps if Makedonians should come with me, and they find you unprepared, we would be disgraced (‘we’, in which case I [א, B, and the MT have “we”; the text follows P 46, C, D, and 048] do not say ‘you’,) in this matter. Paul clarified himself in a parenthetical statement to assure the Corinthians that they themselves would not be disgraced if they failed to execute their part of the endeavor, but that because he had boasted to the Makedonians concerning them, only he (where he says “we” on behalf of Timothy as well) would be disgraced. The Greek word ὑπόστασις (5287) is literally translated as matter here. The word is a noun although the King James Version somehow treats it as an adjective and gives it a rather dubious meaning where it has confident. The Majority Text, which for the most part the King James Version had followed, appends the words “of boasting” to the end of the verse. The text of the Christogenea New Testament follows the 3rd century papyrus P46 and the Codices Sinaiticus (א), Vaticanus (B), Ephraemi Syri (C), Claromontanus (D) and Vaticanus Graecus (048). 5 Therefore I have regarded it necessary to summon the brethren in order that they would go to you in advance, and put in order beforehand your previously announced blessing, this to be ready as a blessing, and not just as an advantage. Titus would be included among the brethren which Paul intends here, as Paul had also seemed to indicate in chapter 8 that Titus was given primary responsibility for this task. However it is apparent that when Paul writes the Corinthians concerning these things, he also intends the inclusion of other Christian assemblies in Achaia as well, since in verse 2 he says that “Achaia had been prepared a year ago”. So there is apparently more to Paul's having summoned the brethren and the task assigned to Titus than what is apparent here on the surface of Paul's words. Corinth was only one prominent city in a province which also included Athens and Sparta, among many other lesser but notable ancient Greek cities. However from the context of these epistles, Corinth does seem to be the spiritual center of these assemblies of Christians throughout Achaia. Paul had opened this epistle by addressing it “to the assembly of Yahweh which is in Korinth, with all of the saints who are in the whole of Achaia”. 6 Now this: he who is sowing sparingly, sparingly then shall he reap; and he who is sowing by blessings, by blessings then shall he reap. 7 Each one just as he purposes in the heart; not from out of grief or from out of necessity, for Yahweh would love a cheerful giver. However Paul is not requiring of the Corinthians that they give to the poor liberally, as the King James Version wrongly translates the Greek word ἁπλότης (Strong's # 572), but only that they give sincerely, which is the actual meaning of the word. However Christians should also consider this: holding back when one has enough wealth to give more is not sincerity. Paul never demanded tithes, but Christian communion should be esteemed as greater than tithes. 8 And able is Yahweh to make abundant every favor for you, in order that in everything, at all times, having all self-sufficiency, you may have the advantage in every good deed. We pray that we have abundance so that we ourselves may be self-sufficient, and then in turn with our excess we may help the needy from among our brethren. Therefore where the Word of Yahweh says in Deuteronomy 8:18 that “thou shalt remember the LORD thy God: for it is he that giveth thee power to get wealth, that he may establish his covenant which he sware unto thy fathers”, we see that with our wealth we also have an obligation to our kinsmen. Fulfilling that obligation, we have advantage in every good deed, which stores up for us treasure in heaven, which are the unseen rewards in which every Christian should have an expectation. 9 Just as it is written, “He has dispensed, he has given to the poor, his righteousness remains for the age”. 10 Now He who is supplying besides seed to he who is sowing also wheat-bread for food, He will supply and He will multiply your sowing, and He will increase the produce of your justice [or righteousness]; 11 in every way being enriched in all sincerity, which through us [both Paul and his readers] accomplishes gratitude to Yahweh. In other words, Yahweh God is supplying seed to the sower and in addition to that seed he is also providing to the sower bread for his own food, the language is difficult but our version literally translates every word of the Greek. The King James Version has bountifulness for ἁπλότης, a word which means sincerity, which we have discussed at length when we first encountered it in verse 2 of chapter 8 of this epistle. When we are blessed in our sustenance and our goods, we should give the credit and praise to Yahweh our God. When we in turn are able to provide for needy brethren with our excess, we should do the same. Wealth is a gift from God like any other gift, and all of our gifts should be used towards the edification of the body of Christ. From Isaiah chapter 55: “ 10 For as the rain cometh down, and the snow from heaven, and returneth not thither, but watereth the earth, and maketh it bring forth and bud, that it may give seed to the sower, and bread to the eater”. The Greek word for service here is διάκονία (Strong's # 1248), which is usually ministry in the King James Version. The Greek word for ministry here is λειτουργία (Strong's # 3009), which is often transliterated as liturgy. The word λειτουργία, according to Liddell & Scott, originally described a public service performed for the general good at one's own cost. The Roman Catholic Church later pilfered the word for its own advantage. The poor of the saints in Jerusalem are here for an example, that service to the poor was for the good of the entire body of Christ, and it should be a matter of service in all ages for Christians to see to that same thing among their own needy brethren. Through this, the many would be thankful to God. Yahweh God is honored when Christians perform good deeds for their fellows. Devoting one's life to the betterment of one's Israelite kinsmen is submission to the Gospel of Christ, because He had given His life in that same manner. Christians demonstrate the sincerity of their profession and their own obedience to Christ through the good works that they do for their Christian brethren, which is the sincerity of their partnership, or communion. The Greek word κοινωνία (Strong's # 2842), which Liddell & Scott define as meaning “communion, association, partnership, fellowship” is translated here as partnership in order to emphasize what true Christian communion really is: that all Israelite Christians should be bound to fellowship with one another in a joint endeavor to build the Kingdom of God. The King James Version has distribution here for κοινωνία, which may be the purpose of the fellowship in this context, that the gift of the assemblies be distributed to the poor in Jerusalem, but it is not an accurate meaning of the word. That version also has liberal, which is an adjective, for the noun ἁπλότης, which means sincerity. Likewise, the word ἁπλότης does not properly mean liberal, and the King James translation is dishonest. 14 and in their entreaty for you, yearning for you for the sake of the favor of Yahweh overflowing upon you. The partnership is fulfilled when the recipients of the gifts of the assemblies offer their own thanks to Yahweh God in return for those gifts, as once they are sustained they can offer their prayers and gratitude in exchange for His mercy which has been effected through the assemblies. As Paul of Tarsus in the first 7 chapters of this epistle had used the problems within the assembly at Corinth to demonstrate many of the wonderful aspects of the Gospel of Reconciliation of Israel to Yahweh God, here Paul is using the example of his collection for the poor in Jerusalem as a means to describe how the Kingdom of God should function: in the practice of love and true care for one another. 15 Now gratitude to Yahweh for His indescribable gift. The body of Christ, when it functions in accordance with the Law of God, is indeed an indescribable gift to each and every member. Where the Greek word πρόσωπον appears in contexts such as this, it should improve our understanding of what is meant where similar terms appear in the often-misunderstood phrases “respect of persons” or “respecter of persons”, such as one may find in Romans 2:11 where the King James Version says “For there is no respect of persons with God.” If Scripture is interpreted correctly, such a sentence cannot be used to discredit the fact that Yahweh has chosen Israel exclusively, and that the New Covenant was made explicitly with the same ancient Israelites and their descendants, as His Word states explicitly in so many other places. Here πρόσωπον (Strong's # 4383) is stature, where the King James Version has person, and it is appearance in verse 7 both here and in the King James Version. In a different context we have rendered the word as person, where it is used particularly of the presence of Christ in 2 Corinthians 4:6. The word describes the presence, appearance, or status of an individual, and not at all does it describe the substance of the individual. In James chapter 2 the related word προσωπολημψία was used to refer to the different appearance or status of wealthy Israelites as opposed to poor Israelites. In Romans chapter 2 Paul used it to refer to the difference between the circumcised Israelites of the remnant in Judaea who kept the law, as opposed to the uncircumcised Israelites of the ancient dispersions of Israel who had become pagans and had forsaken the law. Here Paul uses πρόσωπον of his own stature to describe himself as he is in appearance in person, as opposed to the boldness of his words in his epistles. None of these passages have anything to do with race, or whether one is or is not under the covenants, which is another matter entirely and which is addressed by many other passages in Scripture. 2 but I want, not being present, to be bold with the confidence with which I reckon to be daring towards certain others who are reckoning us as walking in accordance with the flesh. The King James Version strips the word παρών [which means “being present”] of its negative particle μή (μὴ παρὼν), which is “not”. Properly the negative particle negates the word or phrase which it precedes, and therefore the negative particle must belong to the participle παρών. But the King James Version applies the negative to the verb which follows instead, which is θαρρῆσαι (“to be bold”). This is a peculiar and incorrect reading which many others have since followed. But the verb θαρρῆσαι to which they have errantly applied the negative particle was also misread. Before going on to discuss that verb, it must be said that the American Standard, English Revised, Weymouth and World English Bible versions of the New Testament also correctly apply the negative particle here, so we are not alone in this instance. The verb θαρρῆσαι, from θαρσέω (2293, “to be bold” here) is read here in the King James Version as well as in most other versions in the 1st person. The verb τολμῆσαι, from τολμάω (5111, “to dare” here) is read in the King James Version as an Infinitive. The -σαι ending is found in certain 2nd person Aorist verbs of the Medium or Passive voices, or as an Aorist Infinitive, but never is it found in the 1st person. This form is found again at 13:7, in the verb ποιῆσαι (4160) which is rendered in the King James Version as “ye do”, in the 2nd person. Weymouth in his translation of the verb θαρρῆσαι correctly rendered it as an infinitive, while all other popular translations seem to have followed the King James. Here I had initially read both θαρρῆσαι and τολμῆσαι in the 2nd person, which was technically correct, but the King James Version rendering of ποιῆσαι in 2 Corinthians 13:7, which is also wrong, helped lead me to believe that the verb form may belong to the second person plural. Not to make excuses for myself, but there were scant resources available when I had originally translated Paul's epistles. However now I have learned that the forms may belong to either the Infinitive, or to the 2nd person singular rather than the plural. Therefore, although the original translation may be technically correct in English (where the number of the pronoun you is ambiguous), the singular verb does not truly fit the context of the passage, and therefore realizing that the words must be translated as Infinitives, I have emended the translation. Nevertheless, Paul has consistently used himself as an example in his epistles, and if he should be bold in his defense of the faith then all Christians should be bold in that same manner. The word λογισμός (3053), here in the plural being translated as reasonings may have been translated as arguments in this context, which Liddell & Scott explain in their definition of the word (λογισμός, II. 2.). 6 also being [ἔχοντες, literally “having”, see L & S at ἔχω, B. II.] in readiness to avenge all disobedience, whenever you shall have fulfilled your obedience. We read at 2 Chronicles 7:14: “If my people, which are called by my name, shall humble themselves, and pray, and seek my face, and turn from their wicked ways; then will I hear from heaven, and will forgive their sin, and will heal their land.” The wicked are not going to be eradicated from this world until the children of Israel who remain decide to turn to obedience in Christ. There is no other alternative. These are three clear prophecies, that Yahweh God shall employ the children of Israel in the destruction of the wicked. However as Paul illustrates here, before the children of Israel can be of any use to their God in that endeavor, they must first fulfill their own obedience. As Paul has illustrated in Romans chapter 12 and more pragmatically here in 2 Corinthians chapters 8 and 9, that includes the conversion of one's own interests into the living dedication of one's life as an ongoing sacrifice for one's brethren. Here Paul teaches that same thing, that in order for Christians to be worthy to partake in the avenging of disobedience, they must first put Christianity into practice, and fulfill their own obedience. Crying out concerning the enemies of God is not sufficient in itself, if one does not demonstrate Christian love for the people of God.